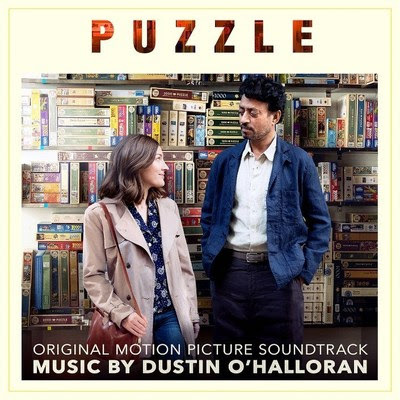 Featuring Ane Brun on New Song "Horizons"
Sony Classical proudly announces the release of "PUZZLE" (Original Motion Picture Soundtrack) with original music by Oscar® and Golden Globe nominee Dustin O'Halloran. The soundtrack is available July 27. The movie opens in U.S. theaters on the same day. Directed by the producer of Little Miss Sunshine, Marc Turtletaub, and starring Golden Globe® nominee Kelly MacDonald (No Country For Old Men, Boardwalk Empire) & Irrfan Kahn (Slumdog Millionaire), "PUZZLE" tells the story of Agnes, who, taken for granted as a suburban mother, discovers a passion for solving jigsaw puzzles that unexpectedly draws her into a new world, where her life unfolds in ways she could never have imagined. Written by Oren Moverman (The Messenger), the movie also stars David Denman, Austin Abrams, Bubba Weiler and Liv Hewson. For updates on the movie, please visit here. Dustin O'Halloran said, "When I saw the first cut of Puzzle I was moved by how such a simple story could be so affecting. I felt a great connection with director Marc Turtletaub and Kelly Macdonald's incredible performance instantly drew me. It was that from which I drew my inspiration and which helped me find the sound of her internal world as she slowly discovers herself and begins to see the world in a new light. For the last track [Horizons], I wanted to see if one of the themes I had been working on could be turned into a song and create this feeling of our character Agnes being in full bloom towards the end of the film. I sent the track to my dear friend Ane Brun who created the beautiful melodies and words that perfectly captured this feeling. Her voice always takes me to another world, and it was exactly this transformative quality that the ending of the film asked for." The roots of Dustin O'Halloran's musical career can be traced back to indie rock, where he made a name for himself in the late '90s as a guitarist and keyboardist for dream pop band Dévics. His debut as a solo artist came in 2004 when he released an album of piano solos, which he followed up with Piano Solos Vol. II two years later. Having caught the attention of Sofia Coppola, the famed director enlisted O'Halloran to compose his first film score for her fourth full-length feature Marie Antoinette (2006). Numerous film and TV credits have since followed: O'Halloran composed the full score for Drake Doremus' Sundance Grand Jury Prize winner Like Crazy (2011), his original theme won a Primetime Emmy Award for Outstanding Main Title Theme Music for critically acclaimed TV series Transparent in 2015, and his score for Lion (2016), which he composed alongside Hauschka, picked up a nomination for Best Original Score at the Oscars, the Golden Globes and the BAFTAs. When he's not writing film and TV scores, O'Halloran performs and records as one half of ambient music duo A Winged Victory for the Sullen alongside artist Adam Bryanbaum Wiltzie.